Avocados contain both mono and polyunsaturated “good” fats, contain antioxidants that enhance your immune response and aid in metabolizing Vitamin A. The phytonutrients in avocados are thought to prevent many chronic diseases. Avocados are cholesterol-free and are high in Fiber, Potassium, Vitamin E, B-Vitamins, and Folic Acid. Avocados are a fruit that is great for fresh, in dips, grilling, and more. We can source all counts (36, 48, 60, 70, 84) of avocados depending on your needs! They can be hard green or pre-conditioned and are always just wonderful as the time they are picked to the time they are consumed! We can supply 4 pack Hass avocado bags to meet your consumer needs! Our bags provide the best quality fruit and are packed 18 bags per case or can be customized to meet your requirements! Kiwi fruit is packed with more Vitamin C than that of an orange. Kiwi contains numerous phytonutrients in addition to vitamins and minerals that promote your health. They are Vitamin K, Copper, Fiber, Vitamin E, Potassium, Manganese, and Folate. Kiwis are also known to be low in calories. Other possible health benefits of kiwis include maintaining healthy skin tone and texture, reducing blood pressure and preventing heart disease and stroke. Kiwis have a sweet but unique flavor that we can’t get enough of! We have them available in a 4 count clamshell, just the right size for a family of four! Onions contain an anti-oxidant called Quercetin that helps protect against cataracts, heart disease, and prevent Osteoporosis. They are also known to be a good source of Vitamin C which boosts the immune system and prevents cancer. Sweet onions may also provide some protection against developing stomach cancer. Onions are great for steaming, baking, grilling, roasting and more. Our sweet onions are grown with love from all over the US and Peru. We source these beauties from Texas, Georgia, Peru, Mexico and more giving us the ability to provide you with a year around Sweet Onion program! Our onions are available in 2, 3 or 4 pound bags or customizable to your consumer needs! Along with our sweet onion bag selection we also offer our sweet onions in bulk cases. This allows those retailers and foodservice customers to have options! These sweet onions come in a 40 pound bulk case so there will be plenty for all your consumers! The Vidalia onion is the most sought after sweet onion! This little gem is available only for the summer months and is grown in Vidalia, Georgia. So, get your Vidalia onions in a 3 pound bag or 40 pound bulk case from April to September! Peppers contain Vitamin C which powers the immune system and keeps skin youthful. The highest amount of Vitamin C is in the red pepper variety. They also contain certain enzymes such as Lutein that protects eyes from cataracts and macular degeneration later in life. As well as reduce “Bad” cholesterol, controls diabetes, and brings relief from pain and eases inflammation. Peppers are great for stuffed, grilled, fire roasted and more. Green peppers are an original favorite of ours! So tasty and great for adding to your favorite dishes. We offer green peppers in 22 lb. bulk cases or the ultimate convenient 2 pack tray. Peppers come in almost all colors of the rainbow! Our hothouse pepper selection offers bell peppers in a variety of colors such as red, orange, and yellow. They are available in 11 pound bulk cases, 3pk Stoplight & Rainbow pepper trays or 2 pack red/red or red/yellow trays. Mini sweet peppers are our newest item and it’s all the rage! Our sweet peppers come in a 16oz. zipper bag that is retail ready with a recipe, UPC and beautiful graphics! These yummy little guys will have your consumers coming back for more! Potatoes provide iron and niacin and are low in sodium and cholesterol. They contain nearly half of the daily recommended allowance of Vitamin C. Also, a great source of Potassium and Fiber and are fat free. Potatoes are a vegetable and are great when baked, roasted, mashed, grilled, sautéed and more. We offer russet potatoes in several retail ready offerings! Our newest 3 pack baker potato tray or the classic 5 and 10 pound bags to the single steamer potato, we have what you need! We have russet potatoes in all sizes from 40 count to 120 count! These yummy, root vegetables come in 50 pound cases or ask about our small size availability! These delicious wonders are a great substitute for a russet potato. They are so creamy and tender they are perfect roasted or as mashed potatoes! Our gold potatoes are available in 12 ounce steamer bags, 24 ounce (C size) bags, 2 pound (B size) bags, and 5 pound (US #1) bags. Gold potatoes for the masses! We offer a 50-pound (C size) bulk case that is perfect for those gold potato lovers! Find some today and see how they can change your same potato routine with this creamy goodness! Red potatoes can add a little color to your favorite mashed potato recipe or side dish! These steamer bags make them ready in just 5 minutes, so there is very little wait until you get to enjoy them! Our steamer bags are available in 12 ounce portions. There can never be too many red potatoes available! With this 50 pound bulk case, you can provide for all your wants and desires to cook with these yummy goodies! Sweet Potatoes are a good source of Beta Carotene, Vitamin C, and Vitamin E. One medium sweet potato has 4 times the daily recommended allowance of Vitamin A and is a great source of dietary fiber and is fat free. Sweet Potatoes are a vegetable and are great eaten raw, pureed, juiced, fried, baked, and steamed. We are your retail sweet potato guru! Whether its bagged sweet potatoes or singles, we have them all. From 3, 6 or 10 pound bags to 12 ounce steamer bags or steamer individual sweet potatoes. For individuals or the sweet potato loving family, we have what you are looking for! If you can’t get enough sweet potatoes like we us, then we offer sweet potatoes in 40 pound cases! That might hold you over for a while but if not, we always have more! Tomatoes are best when picked ripe and contain most of their vitamins when ripe. They are a good source of Vitamin C and Vitamin A. Their red pigment contains an antioxidant called Beta Carotene. The more brilliant red they are the more antioxidants they contain. Tomatoes contain high water content and are low in calories and can reduce risk of heart disease. Tomatoes are a fruit and are consumed fresh, cooked, or juiced. We offer a variety of rounds tomatoes for all your consumer needs! With different pack sizes and bulk offerings, we have it all! Our rounds tomatoes come from the best growers and are available year around. We have 25 pound cases 2, 4 or 6 pack trays, 3 pack clamshells, and more! We can provide you and your consumer with only the best and this means Roma tomatoes. 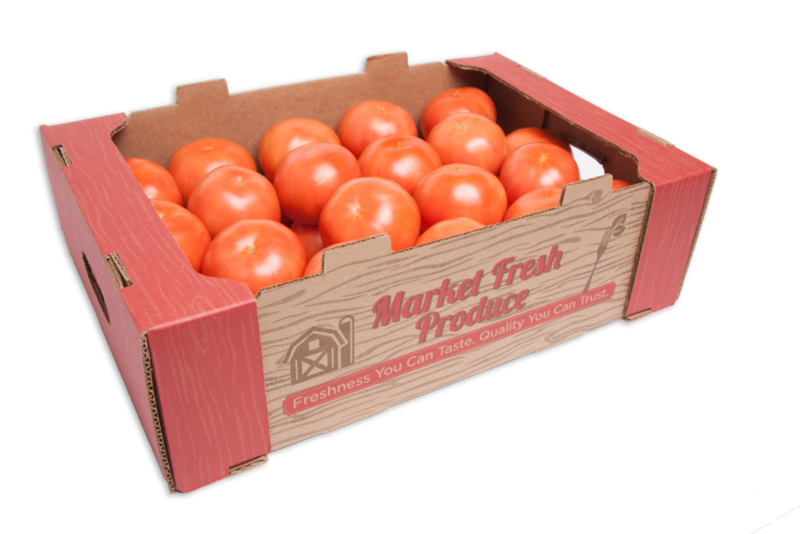 Our Roma tomatoes come in 25 pound cases in various sizes: Medium, Large #1, and XL or packaged Romas that are retail ready. We always have a year around supply! Tomato on the Vines are the best addition to our tomato line! TOV’s are 4 or 5 tomato clusters still on the vine that continue to ripening until the time you use them! They are offered in an 11 pound bulk case. With our TOV program, we have product growing in Canada and Mexico for year around availability! Cherry tomatoes are a wonderful bite size snacking tomato with sweet flavor and juicy insides. We offer cherry tomatoes in the perfect 10 ounce clamshell that is just the right size for your next recipe adventure or family snack! Our grape tomatoes are always great quality and we have a year around program! We have grape tomatoes from the US, Canada and Mexico and come in a few different packaging options! Market Fresh is always growing and expanding our product lines. We can customize pallet sizes, product specifications and create private brands to meet your consumer demands. Contact sales@marketfreshproduce.net for our most current catalog. These decadent little rounds of nutrition are popular again and are in high demand! We now offer them in an 8 ounce tray that is perfect for your shoppers! This tray is prepackaged with nutrition, UPC, and a recipe for the perfect convenience item! This fruit is so universal in their uses and have such a mild flavor. They are great for making squash boats to carry your favorite topping or put it in a casserole and smother it in cheesy or other creamy goodness. This yellow squash is available in bulk cases of US #1 product or prepacked. This green goodness is a summer time favorite and the new go to for a noodle substitute. We offer Zucchini Squash in a 22 pound US #1 bulk case or a 2 pack shelf ready retail package.